We recently added the ability to create, send and e-sign offer letters through JobScore. As we’ve been helping you add offer letter templates to JobScore we bumped into a problem. Many of your offer letters are complex documents with entire sections of text that you add and remove on a case-by-case basis. Select one of a few different paragraphs about benefits. Include a few paragraphs about the terms of a commission plan for salespeople. Include text about the company stock option plan for full time hires. These differences meant creating a new offer template for each permutation, leading to an unruly number of offer templates and making the offers feature hard to use. We’ve addressed this problem by adding a new type of offer field called offer sections, which allow you to use JobScore offer templates to work the way you do offline today. Instead of inserting a simple word or number, offer sections allow you to add and remove blocks of text, so a single offer template can handle a much larger number of offer permutations. 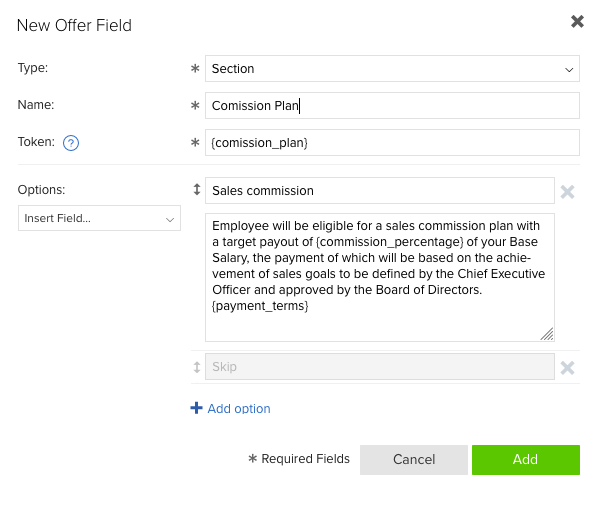 Offer sections are most easily understood using an example… say you need to add a specific block of text for sales candidates about the company commission plan. Offer sections don’t just make it easier to have a smaller number of templates that can handle virtually any type of offer… they make offers easier to use over time. Let’s say your company chooses to offer a candidate relocation assistance for the first time… you can get some text approved by legal and then add it as an offer section to your existing template… then, whenever you create an offer in the future if you want to offer relocation assistance,you just include the section, and if not, just skip it! Making offers easier to use is a critical step as we prepare to open our offer approvals beta. Please email support@jobscore.com if you’d like to participate in the approvals beta.